AFOBIS - » Meet Harel Rush . . .
Home in Los Angeles during a recent break from his studies in mechanical engineering at the University of Maryland, Harel attended with his Dad, Jordan, the American Friends of Beit Issie Shapiro “Positive Exposure” Exhibit and Reception at the Museum of Tolerance on January 12th. Harel first got to know Beit Issie about ten years ago, when he was a Bar Mitzvah. 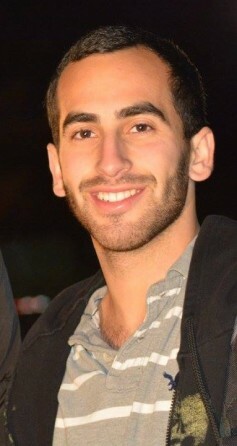 During his studies at Harkham Hillel Hebrew Academy, he viewed a video about Beit Issie Shapiro and felt an immediate connection to the children featured in the film, and he wanted to get involved. He dedicated his Bar Mitzvah to raising funds for our services and programs, and asked friends and family to contribute to Beit Issie instead of giving him gifts. His efforts resulted in contributions totaling about $10,000 for Beit Issie! He then traveled with his family to Ra’anana to have a joint Bar Mitzvah celebration with one of the boys at BIS. But, his interest did not end there. For Purim, he rallied his friends to assist in raising funds in his neighborhood (Pico-Robertson) for BIS. During the summer following his tenth grade, he traveled to Israel and volunteered in the classrooms at Beit Issie for a good portion of his summer. And following his high school graduation from YULA, during his gap year in Israel, he found time to volunteer at Beit Issie. AFOBIS: What was it about the video you first viewed on Beit Issie that “spoke” to you? Harel: I immediately felt a connection when I watched the video. I saw that BIS is a school that does an amazing job at improving the lives of children with special needs, and I wanted to do whatever I could to help. AFOBIS: When did you decide you wanted to visit Beit Issie? Harel: When I visited the campus for my Bar Mitzvah, I knew I wanted to stay connected and volunteer at some point. I was lucky enough to go in the summer after tenth grade at YULA. AFOBIS: What were your first impressions of the campus in Ra’anana, the students and the staff? Harel: I was immediately impressed with everything going on at BIS. The campus provided a welcoming atmosphere. After spending a good ten minutes in the Snoozalin, a dark room with many different lights, I decided that I want one installed in my future home because it was so cool. I noticed the staff was very serious about their work and they did an incredible job, especially with the swimming therapy. It didn’t take me long to understand that the children at BIS were just like regular children. They laughed and played, and just really enjoyed having attention. AFOBIS: What activities did you do with the children? Harel: I worked in a classroom and was paired up with one of the boys because he understood English. I was basically there to help out with the lessons, play with the kids, help feed them, and make sure they were having a good time. AFOBIS: Have you stayed in contact with any staff, children or their families? Harel: I have stayed in contact with some of the staff. Unfortunately I didn’t really meet/know the families, but when I visit BIS, I make sure to say hi to the kids. AFOBIS: Has your experience with children with disabilities influenced your career choices? Harel: Back in the Los Angeles community, I became involved with a few of the Jewish organizations that deal with people that have disabilities. I have always wanted to be an engineer. I would like to think that in the future I could be part of the technological advancements that are improving the lives of people with disabilities. AFOBIS: We hope you will continue to be connected to Beit Issie as you move toward your career goals. How can we in the United States support your interest in Beit Issie and encourage others to participate as you have? Harel: I believe the best way to stay connected to BIS is to visit while in Israel. You will instantly be reminded of the amazing work they do and the importance of staying involved. I encourage others to participate with BIS for a Bar/Bat Mitzvah project, or to find a time to volunteer and learn what BIS is about. Thank you, Harel! Wishing you continued success in your studies at the University of Maryland and we hope you will keep in touch with American Friends of Beit Issie Shapiro, West Coast Region.